Wow! 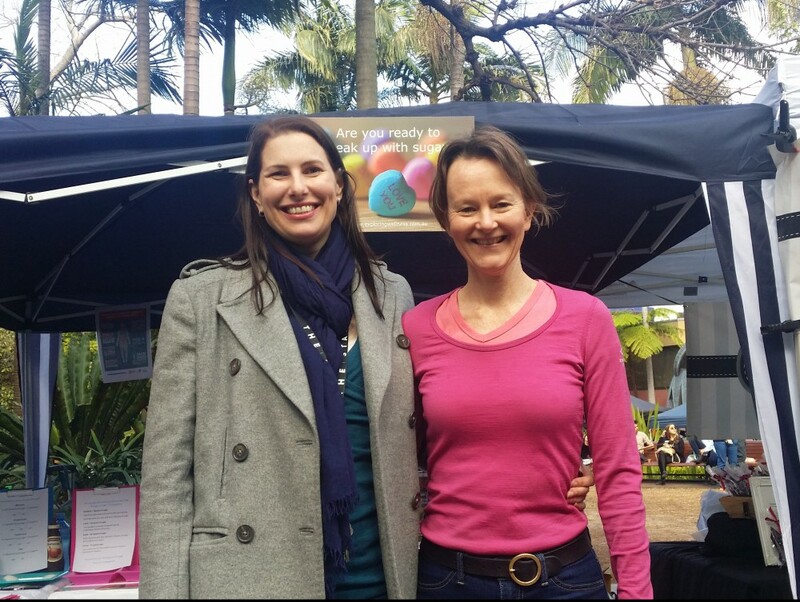 We had an amazing day at the sugar awareness stand at Potts Point market last weekend. 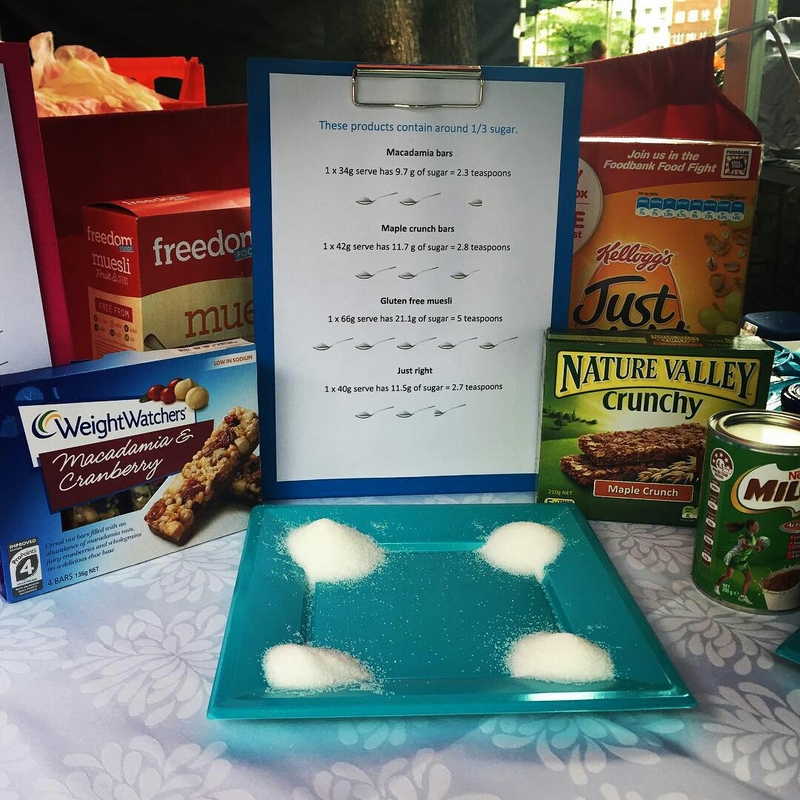 I teamed up with fellow health coach Kristen Martin from MindFeast to talk to the community about the effects of sugar on the body and how much sugar is hidden in “healthy” packet foods. Kristen did a fermented foods demonstration, whipping up some traditional handmade sauerkraut, and talking all things gut health and healing. This month is sugar free September, and there has been a lot of great awareness in the media this month. Jamie Oliver’s “Sugar Rush” was on channel ten, “The sugar conspiracy” and “Is sugar the new fat” on SBS and community viewings of “That sugar film”. 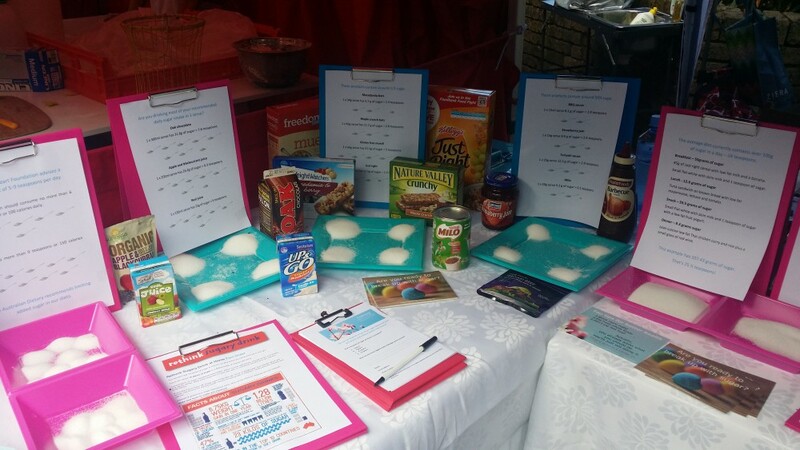 A lot of people we talked to on Saturday were aware of the hidden sugars in packet foods, but a huge number of people were not. It’s great to be part of the message and help build awareness in the community. For those of you who didn’t make it over to visit us, here is some of the information provided on the day. WHO recommends no more than 10% of our daily calories come from added sugar. 10% of the daily calories for a 2000 Calorie a day diet would give you a maximum recommended limit of 12.5 tsp sugar or 52 grams per day. They have also included a recommendation for a further reduction to below 5% or roughly 25 grams or 6 teaspoons per day to provide additional health benefits. The American Heart Foundation advises a maximum limit of 5-9 teaspoons per day. This means women should consume no more than 6 teaspoons of sugar or 100 calories daily. For men, no more than 9 teaspoons or 150 calories from sugar. The Australian Dietary recommends limiting added sugar in our diets. In Australia there is a partnership between the 12 health and community organisations including the diabetes foundations, cancer council and Australian heart foundation called rethink sugary drink, which recommends cutting out sugared beverage intake. 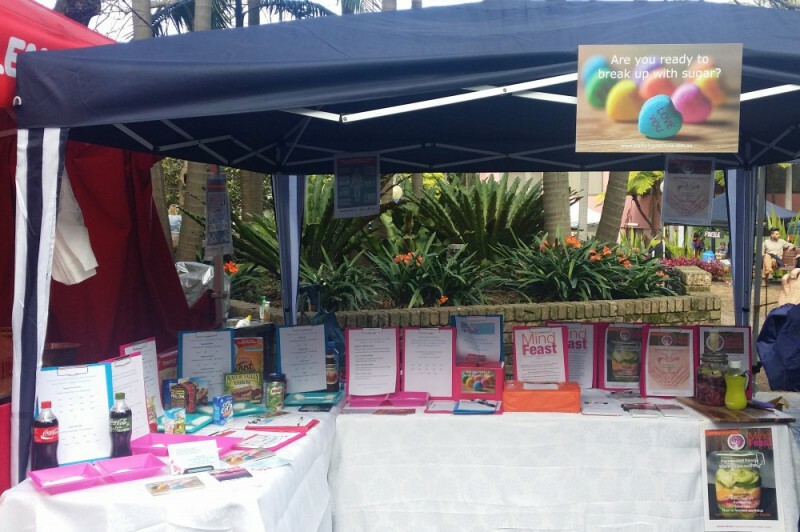 Free sugars – sugar added to food and drink, as well as sugar found naturally in honey, agave, maple syrup, coconut sugar, corn syrup, fruit juices and fruit juice concentrates. 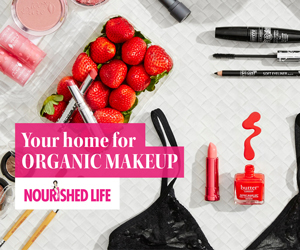 Naturally occurring sugars – found in whole fruit and full fat milk. The recommendations from WHO are referring to free sugars (added sugars) rather than sugar in whole fruits and full fat dairy. The WHO guidelines do not refer to the sugars in fresh fruits and vegetables, and sugars naturally present in milk, because there is no reported evidence of adverse effects of consuming these sugars. I think most of us know that Coke is full of sugar. However the new Coke is advertised as being less sugar, but is it? It has 35% less sugar and Kilo-joules than regular coke. However as regular coke has 64 grams in a 600 ml serve I don’t think it’s that big an improvement! 64g is 15.2 teaspoons. That’s a huge whack of sugar right there in one drink, more than the WHO recommended guidelines. One 600 ml serve of Coca Cola Life has 40 grams of sugar. That’s 9.5 teaspoons. Yes its less, but it is still way more sugar that we should have in one day, let alone one drink. Plus it uses stevia. Yes, if you have natural unprocessed green leaf stevia and sprinkle a bit on your breakfast that’s fine. But the highly processed refined stevia used here is almost as bad as other artificial sweeteners. Your brain will get the sweetness with less calories, and then go looking for them in your next meal or snack. Here are some of the media responses. Here are some hidden sugars. Just right breakfast cereal – one 40g serve has 11.5g of sugar (2.7 teaspoons). This is a small serve, most of us have more than this in a bowl. Gluten free muesli – one 66g serve has 21.1g of sugar (5 teaspoons). The best way to be aware and avoid added sugars is to learn to read the labels. 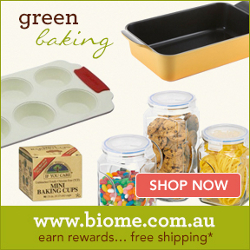 As a general rule you want to look for less than 1 teaspoon per 100 grams in any product. That’s a maximum of 4 grams per 100 grams, ideally under 3 grams is best. Once you know how, it’s easy to keep your sugar intake low generally and knowingly choose to indulge when you want to have that delicious piece of cake! You can also sign up for my newsletter here and Facebook here. Check out Kristen’s Facebook page here. Previous “Spaghetti” with easy pesto. Next The time to be happy is now.